New York Lottery advertises its Collect ‘N Win StubHub promotion in a new commercial. 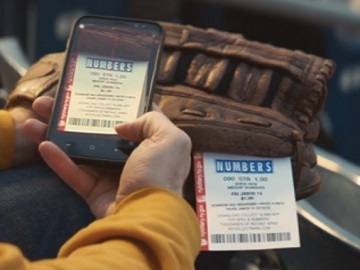 The 30-second spot features Tony, a baseball fan watching a game on a stadium, whose baseball glove starts talking to him and asks him to scan some number tickets with the New York Lottery Collect ‘N Win app. After he does that, the glove tells him he’s entered to win up to five thousand dollars and StubHub gift cards for events like the one he’s attending. In addition, the baseball glove also asks the guy to raise his hand, which – to his surprise – leads to catching a ball with no trouble. New York Lottery NUMBERS & WIN4 Collect ‘N Win promotion began on March 1st, 2019 and will end on March 31st, 2019. The games tickets qualifying for this promotion are any non-cashed New York Lottery NUMBERS or WIN4 game ticket for a midday or evening draw purchased through a New York Lottery licensed sales agent from March 1, 2019 through March 31, 2019. Players can enter the Promotion via the Collect N’ Win website or by downloading the Collect ‘N Win app, available for iOS and Android devices. Once signed in, the player must enter the eighteen digit ticket number found above the barcode on the front of a qualifying non-validated or non-winning New York Lottery NUMBERS or WIN4 ticket. A drawing entry is generated by collecting all six symbols and completing a game card. Once a game card is completed, a drawing entry shall be automatically generated for that player’s account and stored until the scheduled drawing.